Too many people duplicate work that others already have done ... if you're having something remade then tell us about it! Success and Disasters, they are all useful to know about! Bonnet Badge - now in production! The set up tooling has been paid for and the first sample is being produced. Once I have received it I will be checking that it is 99% visually correct and then it will be all systems go! I am hoping that these might be available in time for Santa to deliver. That's good news,well done you have put a lot of time and effort into this project and hopefully you will have no problems selling them. Which firm did you use in the end? I'm interseted in one, purhaps two might be better, stash the 2nd away as a spare. "Keep calm, relax, focus on the problem & PULL THE BLOODY TRIGGER"
'98 MG-F, '69 Ford F250. The sample should be with me early in the new year. If it is a good copy I will post an image of an original and the replacement and see if anyone can spot the difference!! Happy New Year to all! I'm thinking the original is on the right. I also am interested in buying one. Well done. can you give us now the selling price ttc and the delivery price? Do you have a French emission label under the bonnet of your car? 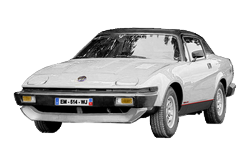 Avez-vous une étiquette d'émission française sous le capot de votre TR7? I have just compared the bonnet badge that Brian Ridley-Jones has had reproduced with an NOS one that I have. It is impossible to see any difference except that it is lighter weight wise. Well done Brian, I know how much work you put into it. Due to an illness at the factory these are not now going to be available in February - looks like March or April. I will update with more information when I know more myself. I will post an updated image when it is received.